Being a fan of Sofia Coppola I went into the screening of Somewhere with high hopes that she would be able to recapture the balance between style and substance that she exhibited in Lost in Translation and seemed to lose in Marie Antoinette. I was not disappointed. This film is a beautifully measured depiction of the suffocating and narcissistic world of the American celebrity. The film begins with a shot of Johnny Marco (Stephen Dorff) driving his black Ferrari in circles around a track. The motif of driving is one that ties the film together in a subtle way, invoking the notion that he is cruising through life. 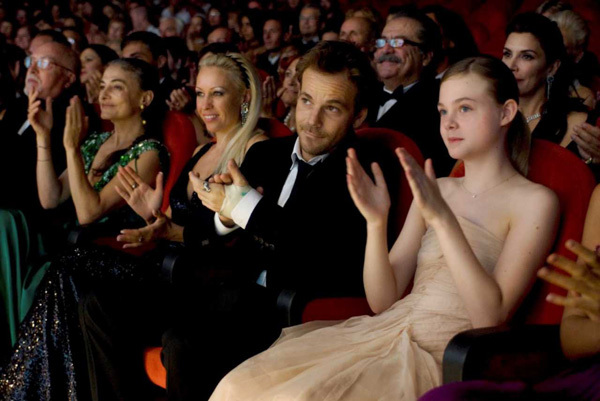 The hedonistic lifestyle that Dorff's character inhabits is the focus of the first two-thirds of the film and is only disrupted by the arrival of his daughter Cleo (Elle Fanning). Their relationship becomes the focus of the last third. One scene in the film is still shot observing Marco simply lighting and smoking a whole cigarette. Despite this, and the fact that the main relationship in the film takes close to an hour to really begin, there was never a point at which I found myself bored. The same can not be said of Coppola's last film Marie Antoinette, a film that I found too heavily reliant upon aesthetics. Somewhere finds the right balance between narrative, aesthetics and sounds to tell the story. Sound Designer Richard Beggs does an amazing job depicting the world that Marco inhabits through his use of incidental noises, the most memorable example being when Marco gest a plaster cast of his face. That scene left me feeling claustrophobic and in awe of his subtle work. The infamous Chateau Marmont in West Hollywood, California, becomes the epicenter of Marco's debauchery. Harris Savides, the Director of Photography, treats the location with respect and honesty, enabling the creation of real characters. Elle Fanning's performance (younger sister of Dakota) is understated in its depiction of an 11 year old girl forming a relationship with her father, while Dorff manages to perfectly capture a celebrity cruising through a life of boredom, parties, drugs and women, only to be jolted awake by the arrival of his daughter. There's a scene where Marco and Cleo play underwater in the pool which is so beautiful in its simple depiction of a father and daughter interacting outside of the confines of the realm of celebrity and Coppola is clearly attacking the lifestyles of so many celebrities within Hollywood. Watching this I couldn't help but recall Coppola's earlier films that had fixations, such as the gormless celebrity played by Anna Farris in Lost in Translation. Fans of the director will be pleased. Somewhere is an intelligent film that requires the audience to be engaged at all times, but it's not difficult to watch. There aren't many criticisms that I have other than a few sloppy mistakes, such as a boom that seems to pop into shot once or twice. 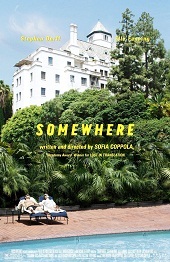 Somewhere is a powerful criticism of the world of the celebrity and a film well worth watching for both fans of, and newcomers to, Coppola's work.